Sipajhar MLA Binanda Saikia on Thursday said the BJP-led Governments both at the Centre and State have been putting “every possible effort so that the economically weaker section of the society gets the maximum benefit from the Government schemes”. Saikia said this while addressing a press conference on Thursday convened by the BJP at Udalguri in the party office where. Talking to media persons, MLA Saikia briefed the media persons of Udalguri district on the achievements of the State and Central Governments in implementing various projects, as part of the nationwide ‘Jana Sampark Abhiyan’. MLA Saikia also presented a detailed report card of the achievements of Sonowal Government in the State and said that with the blessings and support of the people of the State, “the Government is going on right track in development”. He referred to various completed, ongoing and future action plans and projects of the State Government as well as the Central Government. Speaking on the various projects being implemented in Udalguri district, Saikia informed that an amount of Rs 15 crore has been sanctioned to complete the Udalguri Bhairabkunda PWD road under the BADP scheme and soon the road construction would be completed. In the same way, the Asian Development Bank (ADB) had sanctioned an amount of Rs 289 crore to complete the ongoing Udalguri-Tamulpur State Highway, the construction of which is going on a war footing. The BJP leader also said that a total of 413 PMGSY roads in Udalguri district along with 68 RCC bridges would be completed within 2018 while an amount of Rs.31 crore has been sanctioned to complete the Udalguri Sapkati-Bhakatpara road under the Non-lapsable Central Pool of Resources (NLCPR). However, Saikia admitted that the Health and Public Health Engineering sectors in the district are not up to the mark and the Government would take initiative to solve these problems very soon. 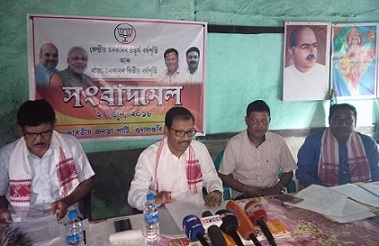 The press conference was also attended by the president and secretary of the Udalguri district committee of BJP, Kartick Boro and Ajay Hazarika respectively.